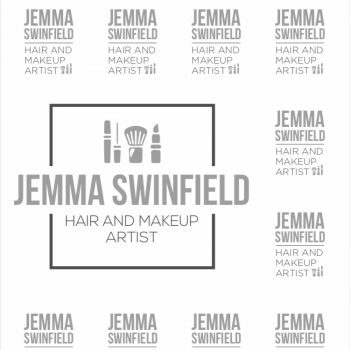 Jemma is a fully qualified level 3, Distinction grade hairdresser. 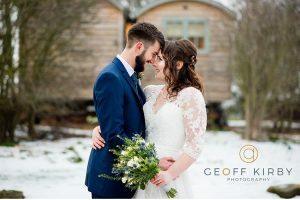 With 2 years of training undertaken and years of practise and practical experience on her happy clients.She chose to specialise in bridal hair and hairstyling as that was what she excelled in and enjoyed the most. Using trusted brands such as Loreal, Schwarzkopf, GHD and Babyliss Pro to achieve you dream hair. 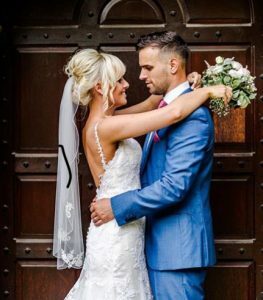 At the trial, you will be advised of what look’s will compliment your bridal style, hair type and personal preference. 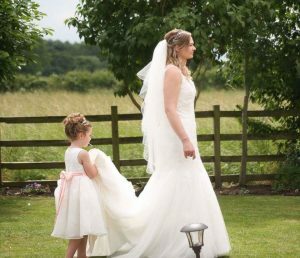 Jemma is always honest with what will hold well, or whether you will need padding or hair extensions in order to make your hair goals a reality. Jemma is happy to try an undo and a down hairstyle on the day of your trial if you are undecided. You do not have to make a set decision on the appointment. 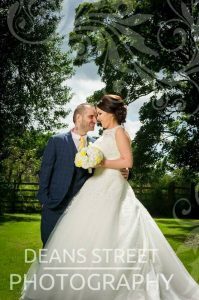 You will find that Jemma is easily accessible for contact via email, text or whatsapp. If you are worried about having short or thin hair. then please rest assured – you are in good hands. 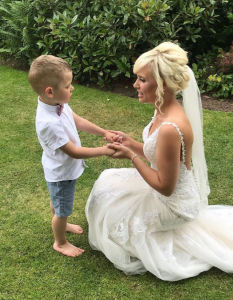 You will be amazed with what magic Jemma can create with some styling tools. 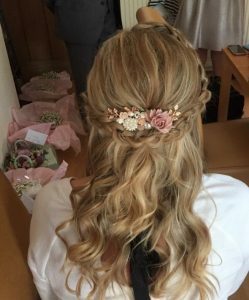 The same applies to clients concerned about thick, long hair dropping – Jemma really has worked with the shortest and longest of hair types. It is a good idea to mention any concerns you have in your initial contact with Jemma so that she can make notes and plan in extra trial time if neccessary. Trials typically take place 4-12 weeks prior to the big day. 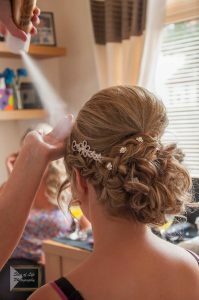 This ensures that your hair is at its length and texture it will most likely to be on the day you get married. 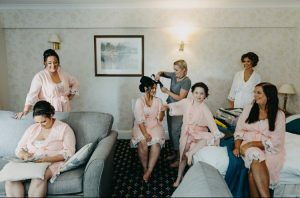 Jemma can style the bride, and any of the bridal parties hair. Large numbers of people aren’t a problem as assistants can be hired for a small additional fee. 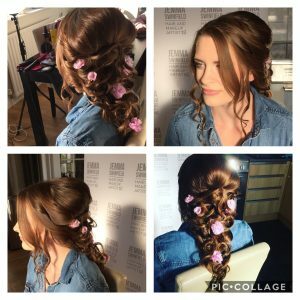 Rapunzel hair – inspired by the market scene in “Tangled” the movie. 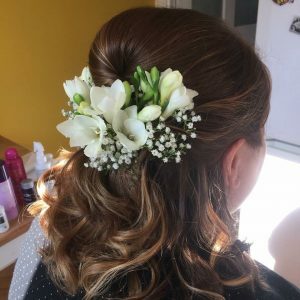 This bridesmaid’s hair up is very popular. Finished with “babies breath” flowers. 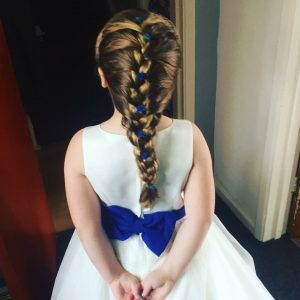 Flower girl hair – a dutch braid will keep young girls hair neat. 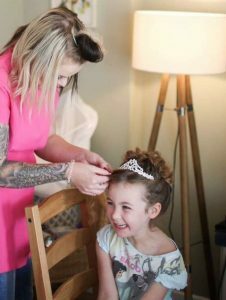 The finishing touches to a very special bridesmaid on her mummy’s big day. This hair contains clip in extensions as the client had shoulder length, fine hair to begin with. 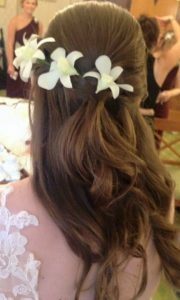 Half up, half down styles are great for brides who don’t like their hair all up. 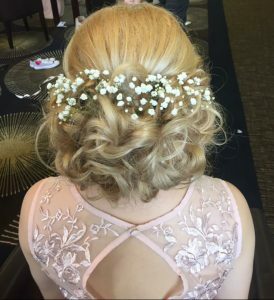 On the flip side – up do’s can show off your gorgeous gown. 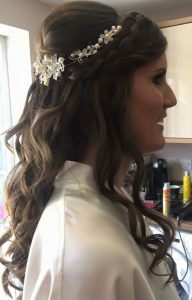 The boho bridal hair is very popular right now. Highlights in the hair can help to show off such looks. 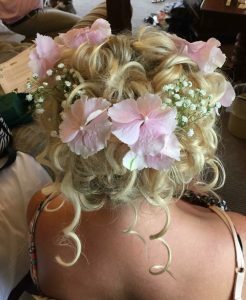 These flowers were individually wired by the brides florist and Jemma arranged and fitted them after styling the hair.